We arrived at Ernaculum Town station in Kochi later than expected – it was already getting close to dusk. We didn’t know it, but we still had another 1 hour journey to take us to our guesthouse in Fort Kochi. Outside the train station, there was a large queue … and a surprisingly orderly system for picking up a rickshaw. You first go to a booth and pay 1 rupee to the cashier. After stating your destination, the cashier gives you a ticket and a fixed price that you must pay to your rickshaw driver when you reach your destination. The rickshaws are all queued up by the booth waiting for customers, just like taxis at an airport. This was much better than flagging down a rickshaw from the street and haggling a price on the spot. It was a long journey from the station to Fort Kochi since the driver had to take a long detour south to reach the bridges. There were two long stretches of river we needed to cross. After that we had the busy rush hour traffic to deal with before reaching Fort Kochi. It can be cheaper (and quicker) to take a ferry followed by a shorter rickshaw ride, but after a long day travelling in a Sleeper Class coach, we really didn’t want the extra hassle. 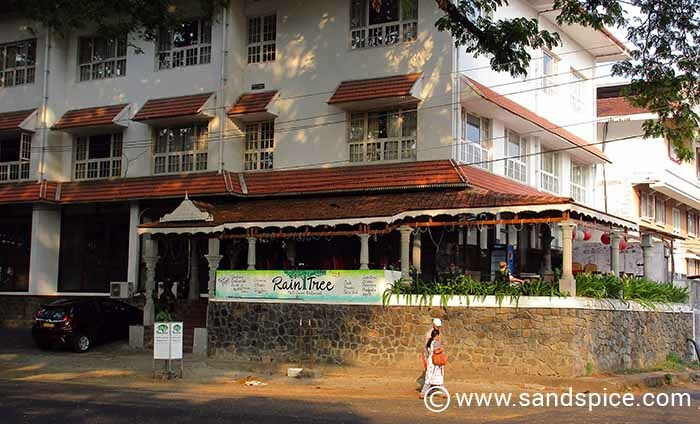 We had booked a 3-night stay at the Fort Muziris hotel in the center of Fort Kochi. We’d arranged to pay 1,000 rupees per night, including breakfast (€14 per night). All the staff at Fort Muziris were friendly, helpful and courteous. We exchanged emails before our arrival and received useful tips and information. Our problem was with the room they gave us when we did arrive. It was on the ground floor right next to the main entrance. Inside the room, we had a window view of a brick wall 2 feet away. The area outside just below our window was full of rubbish. The room was pretty run-down, with an old creaking metal filing cabinet for a wardrobe. We later discovered that this filing cabinet covered an unlocked door leading to the outside of the guesthouse. With a good push on the door from the outside you could hear the filing cabinet move inside the room. The room was grubby, with threadbare towels and a wafer-thin mattress. We asked for a different room, but apparently there was nothing else available. The real issues started when we switched off the lights to sleep. After an hour, we were woken up by something crawling over us. It turned out to be a large cockroach. That sort of ruined our first night, knowing that when you see one, there’s another 10 you can’t see. … and being on the ground floor in a town like Kochi doesn’t help. The rest of the hotel was oddly ramshackle and not too clean, so we decided not to eat there. In fact all we really wanted was to be somewhere else. 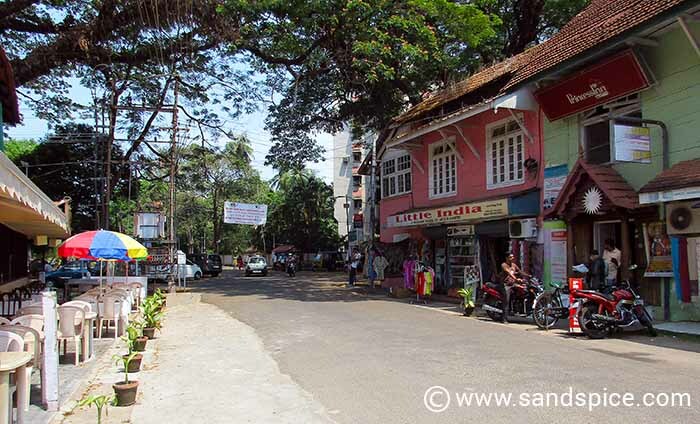 Fort Kochi itself is a low-key Indian town with the usual quota of gift shops, tourist restaurants and travel agents. We spent the following day walking around, and had seen pretty much everything by early afternoon. The restaurants were uninspiring, but perhaps the most frustrating thing of all was the absence of booze. After our under-whelming introduction to Kochi, the one thing we needed was a drink. Everywhere seemed to be tea-total. It was only when we inquired at one particular establishment that we struck lucky. They were prepared to serve us what they called “Special Tea”. This was simply a large bottle of beer decanted into a tea pot and served with 2 large tea mugs. The beer wasn’t too cold, but we weren’t complaining as long as we could order a 2nd pot. The state of Kerala is officially a dry state, and there are fines for places which overtly flout the law by selling alcohol. If you want the name of this establishment, you’ll have to email us. We don’t want to be reason why this oasis in Kochi has to shut down. We also had a couple of good meals in this same establishment. There are a few beaches in Fort Kochi, but you wouldn’t want to use them. They’re not too clean, and you’d quickly gather an audience of leering fishermen if you tried to sunbathe. 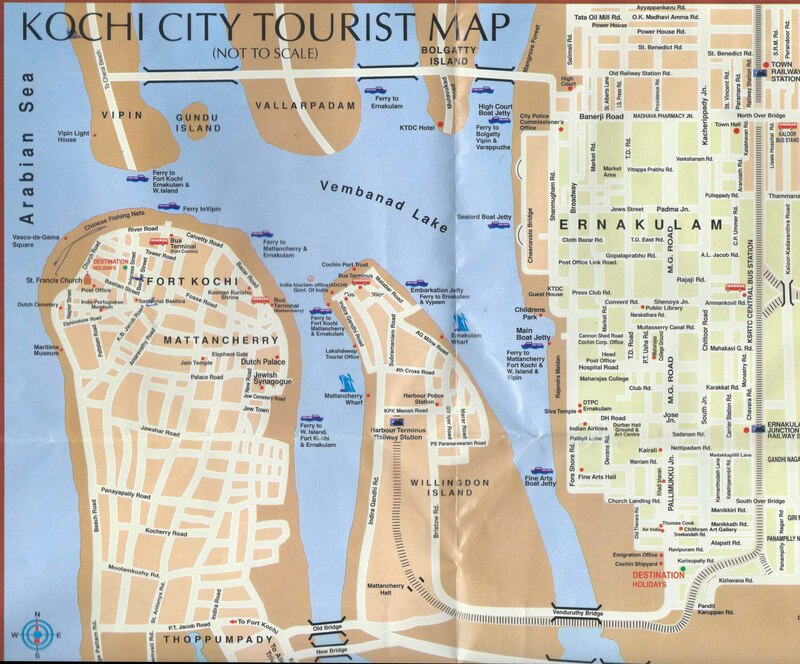 I overheard a local Travel Agent advising some young tourists to take a taxi out of Fort Kochi if they wanted to find a decent beach. Fort Kochi – Getting in and out ! 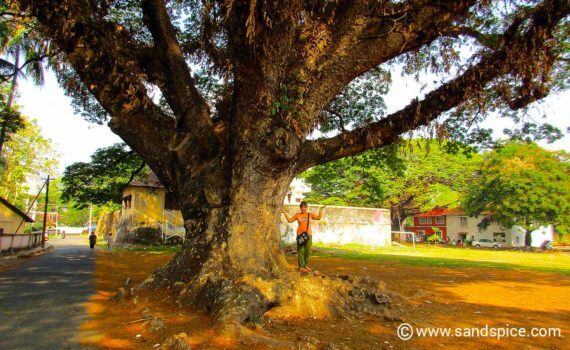 You can visit the old jail complex at Fort Kochi. This is a prominent heritage landmark of erstwhile British Kochi. 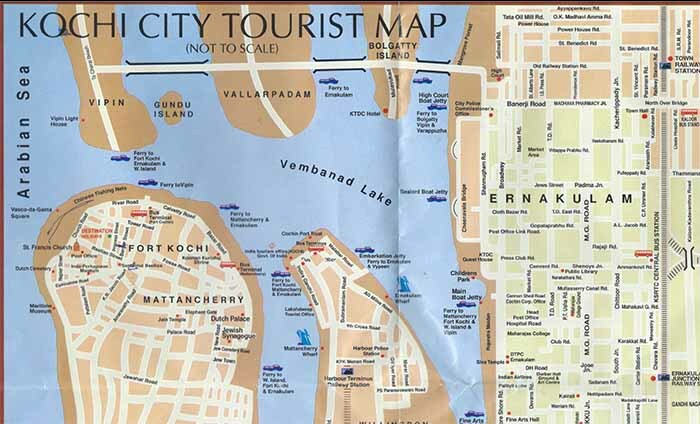 In fact, Fort Kochi and Mattancherry are the oldest European settlements in India. This jail complex seldom catches the eye of visitors. 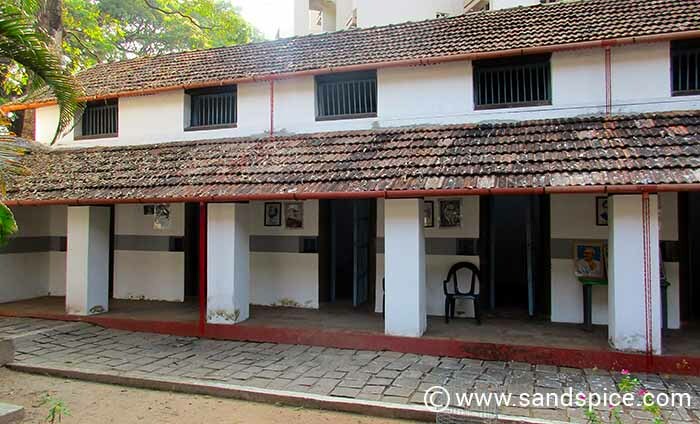 Located near the Fort Kochi police station, the compound houses a well and eight cells where freedom fighters were imprisoned. We just wandered through the open gate through curiosity (we couldn’t find much else to do in Kochi). A caretaker soon descended on us and invited us to take a look around (and make a donation). We also half-heartedly checked out a number of other guesthouses in the area – we really didn’t want to spend another night in Cockroach Central. After just 18 hours in Kochi, we were looking for the exits. We’d pre-booked ourselves in for 3 nights, but we’d already had enough. We had some lunch and brainstormed our options. We had 2 more nights to look forward to in our infested guesthouse (and 2 more days in an uninspiring town). 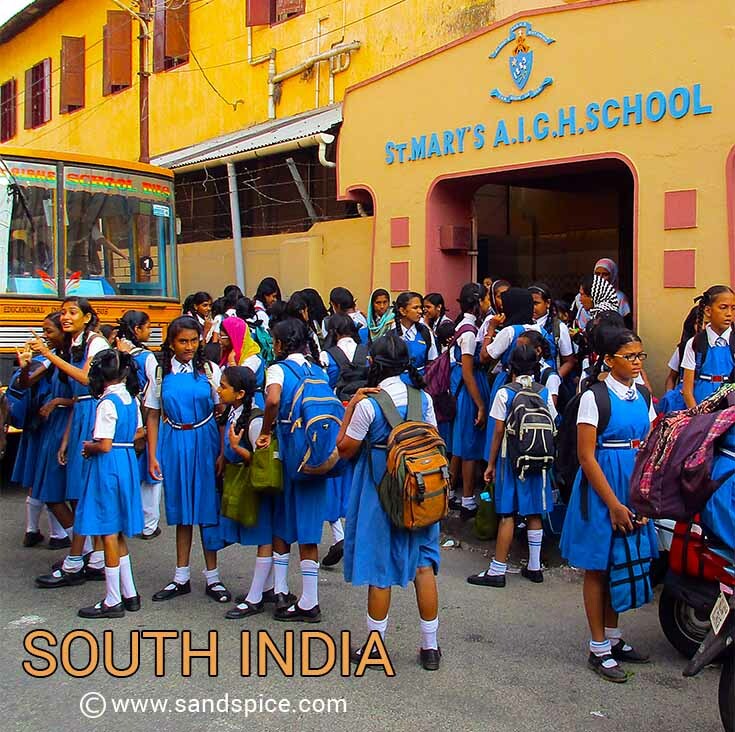 We then had the prospect of a 7½-hour train journey – leaving at 05:00 am – from Kochin to Mangalore (AC3 class), then a night in Mangalore, followed by another 5-hour train journey – leaving at 06:15 am – from Mangalore to Karwar in South Goa (Sleeper class). All of this was feeling a bit stressful, and frankly quite depressing. We knew in advance that this section of our trip would be unpredictable: What we thought would be an adventure was now just looking like hard graft. What if we could just leave Kochi that evening on a train direct to Goa? We’d already paid around 2,000 rupees for the train tickets we wouldn’t use, and may have to pay for the coming 2 nights in our guesthouse. But can you put a price on peace of mind? We went to see a Travel Agent we’d noticed earlier, not far from our Guesthouse. Miraculously, the agent was able to secure seats for us on an AC3 train leaving that evening from Kochi, and arriving the following morning in Madgaon, Goa. Our relief (and luck) was palpable. We returned to the guesthouse to pack, and to let them know we would be leaving in the early evening. To their credit, they billed us only for 2 of the 3 nights, and even offered to help with our onward travel. As I said earlier, we had no complaints about the staff at Fort Muziris, just the condition of our room. We had one last meal at the No.18 Hotel before hailing a rickshaw and heading to the train station. We were just hoping that our next train journey would be an improvement on the previous one.